OPPO is set to add new products – OPPO F11 andF11 Pro – to its beloved F series of mobile phones. In addition to inheriting the ‘selfie function’ of the F series as well as the sleek gradient design of F9, the F11 series boasts several new innovative technologies and is equipped with a new 48MP ultra-clear camera system, a rising camera, and a panoramic screen, bringing customers a more comfortable and flawless user experience. The new smartphone will be launched on the 15thof April in the Egyptian market. explained Andy Shi, the President of OPPO Middle East & Africa. The favorite camera phone brand of young people everywhere, OPPO, is committed to providing creative youth with inventive mobile phones that allow them to snap and share expressions of themselves and the world around them. Seeing as portraits are the most popular form of smartphone photography, OPPO first devised a ‘selfie function’, quickly establishing them as the “Selfie Expert” and one of the most beloved brands in the Middle East. The mobile phone’s fantastic portrait photography was not only popular among customers, but enriched OPPO’s legacy and standing as the ultimate “Selfie Expert”. OPPO continued to innovate, releasing the stunning F9, integrating the first dual rear camera to unveil an excellent depth of field effect. Building on the groundbreaking dual rear camera and portrait technology of F9, OPPO’s F11 series elevates the F series to a higher level, upgrading the mobile phones and OPPO itself from “Selfie Expert” to “Portrait Master”. Supported by OPPO’s powerful camera technology, the F11 series is equipped with the most advanced camera system of the F series. As the rear camera, has been significantly upgraded, the F11 series features an ultra-high standard 48MP+5MP dual camera system, F1.79 aperture, 6P lens, and 1/2.3-inch image sensors to bring more light. In bright light environments, the devices can directly output 48MP ultra HD pictures. In dark environments, the F11 series’ “Tetracell technology” analyzes and combines the data acquired by four adjacent pixels to make it equivalent to a single pixel size of 1.6μm, doubling the size of the photosensitive pixel and shooting brighter and low-noise night portraits. 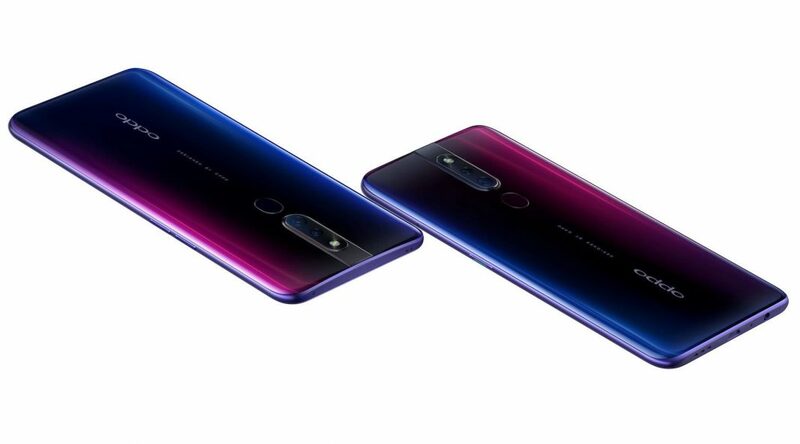 The F11 series is also powered by Ultra Night Mode and Dazzle Color Mode, OPPO’s system-level optimization solution specially designed for smartphone photography. This solution automatically recognizes the shooting scene and matches it with the targeted optimization solution. In Ultra Night Mode, it distinguishes between portraits and backgrounds, focuses on faces, and adjusts skin color in night portraits to enliven the overall effect. F11 Pro captures a new design breakthrough that integrates vivid natural beauty into the streamlined sleekness of the gradient. Driven by the aesthetic concept of “natural creation”, OPPO draws inspiration from the beauty of natural light, which is reflected in the rhythmic beauty of F11 Pro’s color flows. This was achieved by a breakthrough in process and materials. The OPPO F11 Pro has two gradient color options: Thunder Black and Aurora Green. Thunder Black features the first triple-color gradient design. Blending red and blue into classic black, like a meteor streaking across the night sky, it creates a unique feeling. Aurora Green is created by adopting the double-color gradient design. It is inspired by the view of the earth from space, with its vibrant blue oceans interwoven with lush green continents, blue and green blend together into one, and when exposed to dynamic light, it radiates a distinct vitality.